IgG1 proteolytic cleavage by the papain gives two Fab (Fragment antigen binding) fragments and a Fc fragment. 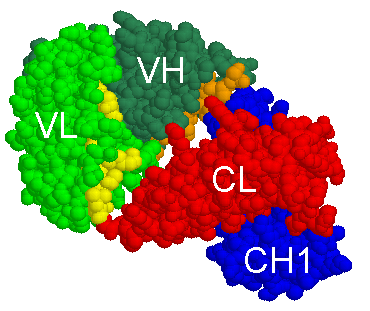 The Fab fragments retain the ability to bind antigen because each contains paired VL and VH domains. VH corresponds to the V-D-J-REGION (in green (V), orange (DJ)) of the heavy chain. VL corresponds to the V-J-REGION (in green (V) and yellow (J)) of the light chain.